Foam for upholstery smelling PURE; surface active agent which, thanks to the delicate texture of the foam penetrates deep into the structure of the fiber upholstery and removes dirt. Easily refresh armchairs, sofa and other items made of velor upholstery and traditional fabrics. Dirt occurring during the use of the car effectively clean the active ingredients contained in the preparation, and the addition of fragrance to neutralize unpleasant odors. 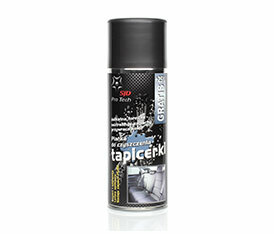 Effortlessly upholstery recovers the original color, and the interior of the car again becomes an aesthetic and pleasant.